Successfully Added Arduino 3D Printer Controller Kit - Mega 2560 Board, 3D Printer Controller RAMPS 1.4 Board, 5 Steppers, SD Card Slot, 12V, 180W to your Shopping Cart. The Arduino 3D Printer Controller Kit has been designed specifically for beginning 3D enthusiasts that are interested in entering the limitless world of 3D printing. 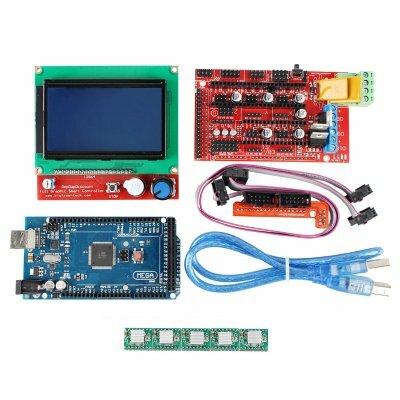 This kit includes a complete set of the most common and useful components that can be used by all tech-savvy people out there to build their own printer controller. With this controller kit in place, you’ll be able to easily print all your projects without the need of your PC. Simply slide in your SD card filled with g-code designs and you’ll be all set to print your next art projects in high precision. This kit includes the high-end mega 2560 board from Arduino and 5 steppers. The 3D printer controller has been designed to run at voltages ups to 12V and is capable of handling a maximum Wattage of about 180W. With all this power at hand, you’ll be able to run your controller at higher speeds and precision – bringing along great efficiency during your upcoming 3D printing projects. Besides its main board and 5 steppers, this Arduino Kit furthermore comes with a 3D printer controller RAMPS 1.4 Board, a sufficient LCD display with control board, two flat cables, and a smart adapter. The LCD display board that has been included in the packages features an SD-card reader, a rotary encoder, and a 128 character x 64 line LCD display. Your ramps can be easily connected to the controller by using the smart adapter included. Once all components are connected, you’ll be able to print all your 3D projects straight from your SD card without ever needing your PC again. By allowing you to print all your designs by merely using your g-codes stored on a TF card, the Arduino 3D Printer Controller Kit brings along high efficiency for all 3D printer fanatics out there. This 3D Printer Controller Kit comes with a 12 months warranty, brought to you by the leader in electronic devices as well as wholesale electronic gadgets.. This kit consists of a RAMPS 1.4 shield, an Mega 2560 board, five Stepper drivers and a LCD. It can control up to 5 stepper motors with 1/16 stepping precision and interface with a hotend, a heatbed, a fan (or a second hotend), a LCD controller, a 12V (or 24V with appropriate modification) power supply, up to three thermistors, and up to six end stoppers. RAMPS 1.4 shield is a popular control board for RepRap Prusa i3 3D compatible printer. LCD 12864 with Controller contains an SD-Card reader, a rotary encoder and a 128 Character x 64 Line LCD display. Arabic: - طقم تحكم الطابعة ثلاثية الأبعاد - Chinese Simplified: - 3D 打印机控制器套件 - Czech: - 3D tiskárna řadiče Kit - Danish: - 3D Printer Controller Kit - Dutch: - 3D-Printer-controllerkit - French: - Kit contrôleur imprimante 3D - German: - 3D Drucker-Controller Kit - Hebrew: - ערכת בקר במדפסת תלת-ממד - Hindi: - 3 डी प्रिंटर नियंत्रक किट - Italian: - Kit Controller stampante 3D - Japanese: - 3 D プリンター コント ローラー キット - Korean: - 3D 프린터 컨트롤러 키트 - Malay: - Kit pengawal pencetak 3D - Norwegian Bokmål: - 3D-skriver kontrolleren Kit - Romanian: - Kit de controler imprimanta 3D - Russian: - Kit контроллер 3D принтер - Spanish: - Kit de controlador de impresora 3D - Thai: - ชุดควบคุมของเครื่องพิมพ์ 3D - Turkish: - 3D printerlere harcama maddeler denetleyicisi kiti - Vietnamese: - Bộ điều khiển máy in 3D.